This is one visit to the YWCAs that I had long anticipated for many years. I had just joined the world movement in 2008 when the International Aids Conference was held in Mexico City. I was barely eight months on the job and led a very powerful delegation of YWCA leaders to this important country and to this critical event. 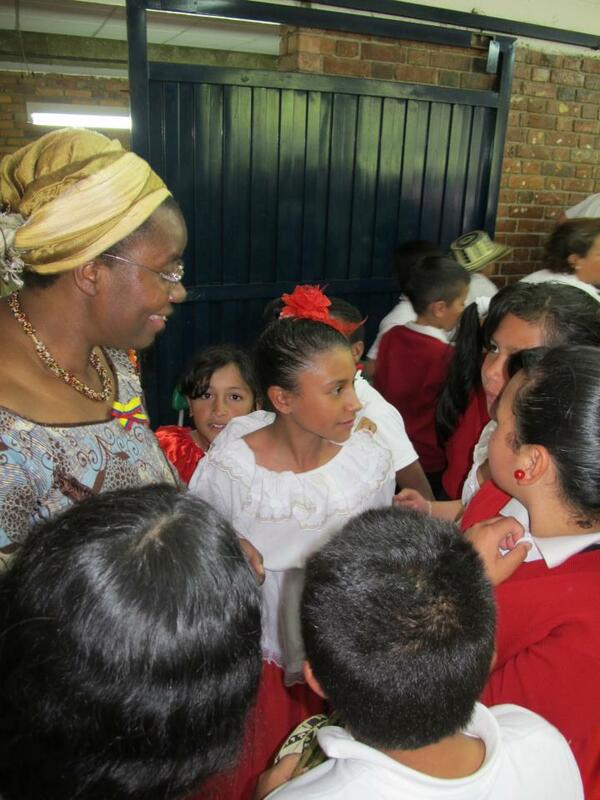 It was my first visit to the Latin America region, and my first visit with the YWCA in local communities. We met with YWCA of Mexico and visited the YWCA of Naucalpan. We also meet with members from other local associations, including Guadalajara. I wanted to know more, learn more, dig into the history of our movement, and listen to the names of the women who have created presence of our movement in this region. The time and the opportunity did not qualitatively quench my thirst, although it gave me good enough insight. I sat with the members who had come from other countries in the region, Lizette from Peru, Xinia from Costa Rica and Jucara from YWCA of Brazil. One day I will do a proper visit to this region, was the singular feeling that I carried, as I marched the streets of Mexico chanting mujeres derechos, together with thousands of others at the AIDS conference. I stood on that stage with Annie Lennox, passing the core message of rights of women, and girls in the AIDS response. I knew that I just must come back to this region, which held intrigue for me and also inspiration and passion. I recalled many years ago, when as a young woman lawyer I was actively involved in the women and law movement, and Cladem was one of the strong organisations that inspired me and it was then that I had met the current chair of the CEDAW committee Silvia Pimentel. In the last years, the journey to Latin America started to gain a life of its own as I was also growing with the movement. As they General Secretary of the World YWCA, it was also clear that effective representation is beyond words, reading reports, and update or phone calls from friends, colleagues and mentors. For one to be a leader, one must also experience. Many women from the region within and outside the movement had over these years nurtured, advised, and enabled. The many moments that I have been with Monica Zetzsche, past World YWCA President from Argentina, she had always whispered in her quiet way and with all the wisdom, you will finally come, and when it is the right time and the right moment; it is not just for you to decide, it also God’s decision. She came to the 27th world YWCA council in Zurich and offered the much needed support and advise, as we all received one of the leading global women leaders from the Latin America region in our midst, former President of Chile Michelle Bachelet, who is the first Executive Director for the United Nations entity for gender equality and women’s empowerment (UN women). Michelle Bachelet stood in the ground and reminded all of us gathered that women’s rights and empowerment is all about leadership, participation in decision making and improvising the economic status of women. It is also about always securing and protecting women’s rights and ending violence against women. I recall these words as I journey to Latin America, to steep myself in the knowledge and the wisdom of this region. In addition to the many women leaders from the region who served and continue to serve on our world board like Valeria, Silvanna, Andrea and many others before them, I have also cherished the wisdom and advise from my staff colleagues Ana Villanueva, Caterina Lemp, Maria Petty and our former interns and volunteers from Latin America. The YWCA movement is always about the empowerment and rights of women, carrying with it an intergenerational approach that affirms volunteers of all ages, lifts the leadership of young women and values the wisdoms and experience of its older members. Today, I woke up earlier than usual. I did not want at all to miss this flight. My journey to Latin America has finally arrived, all in God’s own time. My travel mates Caterina Lemp and Natasha Nogarede where surprised to see me arrive early at the airport. I had promised that I will not oversleep! It’s a great team. Amongst ourselves we are carrying the history of the movement as staff and volunteer with our own diversities of age, background and nationalities. We will be the collective eyes and ears for listening, learning and sharing. I am looking forward to the next two weeks of visiting with the YWCAs of Colombia, Bolivia and Peru; to meeting sisters, some of whom I had met in person and others I have heard and read about. I have the feeling of stepping my toes on the YWCA sacred space in many communities and know that each YWCA carries generations of generosity of giving, sharing and being. And I know that there are many women and girls who have made it possible for the YWCA to sustain its significant presence over the decades in this region. The YWCA is present in ten countries in Latin America: Argentina, Brazil, Chile, El Salvador, Honduras, Mexico and Uruguay in addition to those I am visiting. I am looking forward to the meetings, the sharing with our ecumenical partners and friends at UN Women, ICCO and other women, youth and ecumenical organizations. Indeed the food, the language, the culture and the music are part of what enrich the experiences in one’s encounters. As a poet, culture, history and social life stirs that something deep within. My friends in the region, Alessandra Nilo in Brazil, Mabel Bianco in Argentina, Violeta Ross in Bolivia, Ana Falú, Mónica Pizani… Hola!